The Singel, the canal near Utrecht Vredenburg, has been out of the picture for some time now. Many see it as a big loss. For this reason the municipality of Utrecht wanted to restore the Singel to its former glory. This caused a lot of maintenance work around the station Utrecht Centraal, which lead to irritations from many residents and visitors. How can you take away these irritations? By showing what you are creating in the end. "Take a look into the future and the past at the same time"
Everyone who has a smartphone is able to take a look in the future at the Marga Klompébrug. 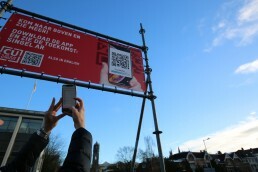 By downloading the Singel AR application and scanning a QR code the new Singel will be shown through augmented reality. Besides showing what the Singel will look like in the future, the app also shows the changes of the Singel during different time periods through a timeline. The app provides a better picture of the end result for residents and visitors, which leads to more understanding for the maintenance work around the station. In addition the app was seen as a fun and innovative experience. The new Singel is expected to be finished in 2020.